A few facts on grid-scale solar energy in California, and other states. 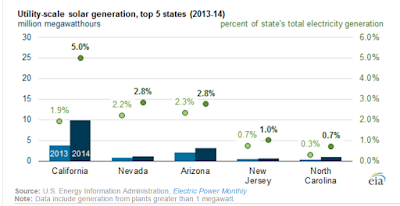 This is from The US Energy Information Agency, March 2015. see link Title: "California first state to generate more than 5% of electricity from utility-scale solar." Excerpt: "California has become the first state with more than 5% of its annual utility-scale electricity generation from utility-scale solar power, according to EIA's Electric Power Monthly. California's utility-scale (1 megawatt (MW) or larger) solar plants generated a record 9.9 million megawatthours (MWh) of electricity in 2014, an increase of 6.1 million MWh from 2013. California's utility-scale solar production in 2014 was more than three times the output of the next-highest state, Arizona, and more than all other states combined. "Several large plants were phased into operation in California during 2014, including two 550 MW solar photovoltaic plants, Topaz and Desert Sunlight (Phases 1 and 2), as well as the 377 MW Ivanpah (Phases 1, 2, and 3) and the 250 MW Genesis solar thermal plants. In total, nearly 1,900 MW of new utility-scale solar capacity was added, bringing the state's utility-scale capacity for all solar technologies to 5,400 MW by the end of 2014." 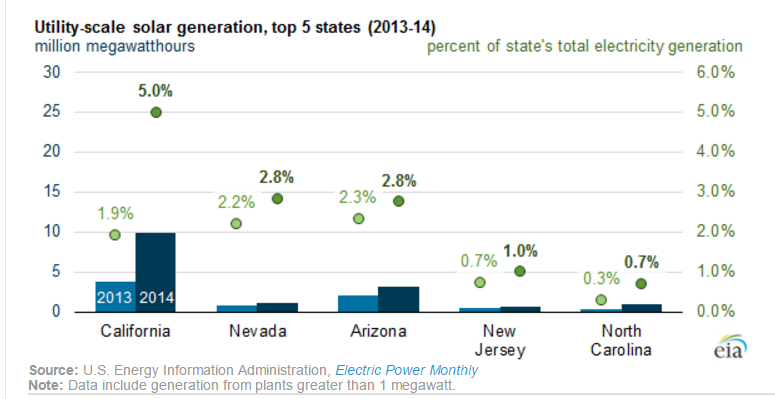 And to those who argue that California also has the highest electricity prices in the US, that is simply incorrect. California residential electricity price is approximately 17 cents per kWh in early 2016, with 8 other states having a higher price. California's high prices are due in part to the large population (39 million people) and low electricity consumption per capita. The utilities must bill more per kWh to pay for the infrastructure. Peak demand is approximately 45,000 MW, while average demand is only 33,000 MW. The wind resources in California are fairly good, but are limited to few locations. These are almost fully developed at this point. However, the vacant desert land is enormous in extent, and has yet to have most of the free sunshine harvested and converted to inexhaustible electricity.